One of the reasons that I like keeping chickens is that it gives me an excuse to have a barn in my backyard. I love barns. Even if you have a small coop, you can still call it a barn! I think that barns have a beauty born of practicality and use. First and foremost, they have a purpose. Each design decision must make the animals’ needs a priority. Dirt is not a good idea. 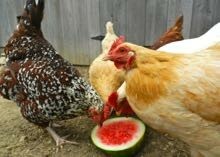 Yes, chickens love to dig in it, but that’s the only positive attribute. It holds onto ammonia, manure, parasites, and moisture. Predators can burrow in. I have friends who have an antique barn. They sectioned off a corner for their hens. Within a month they were overrun with rats. 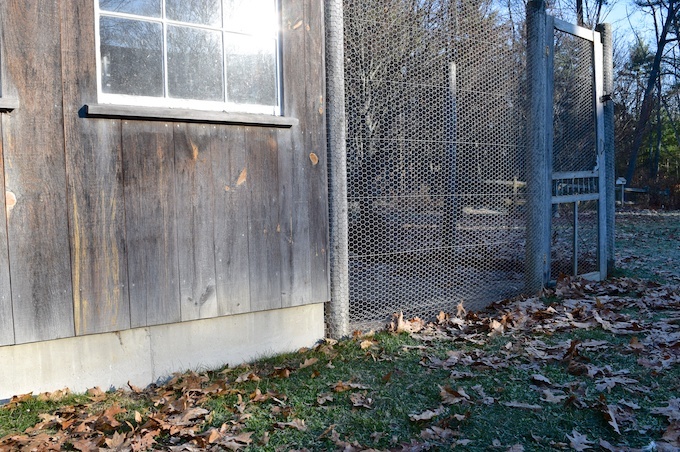 They moved the hens to what had been a concrete dog run, and the rat problem disappeared. I am not a proponent of the deep litter system, which is sometimes done on a dirt base. Read more about that here. I only include this because I have recently seen prefab coops being sold with hardware cloth (sturdy wire mesh) floors. Chickens should not be kept for any length of time on wire! (The exception is the anti-broody coop, but that’s only 4 days.) Chicken feet will get sores, or worse, from wire. Hens can’t move easily on wire, and they can’t scratch. Some of these coops are coming from a manufacturer in Texas, who claims that they are perfectly suited for cold weather. They are not, as cold air will draft right up to your hen’s bottoms. Please avoid hardware cloth floors. This is the flooring that I prefer. It is predator proof. Here you can see the foundation of my barn. Nothing can get in. Concrete is easy to keep clean. I actually enjoy sweeping the barn. Chickens don’t need a rubber mat. However, in the winter I do add a bit of extra bedding. Concrete doesn’t harbor mites, moisture or smells. If there’s ever an outbreak of disease, I can easily shovel out all of the bedding, vacuum up dust, and disinfect. The downside is that it’s expensive and permanent. You have to be committed to having that barn. But, as I said at the start, I love barns. thank you, teri. i already have a concrete slab in a corner of my back yard. 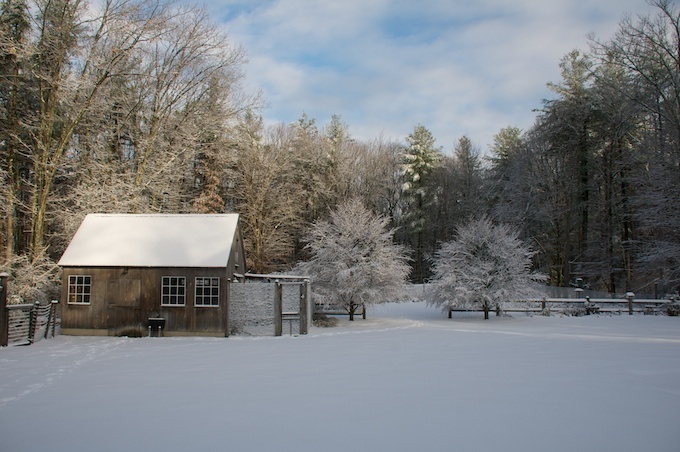 have been thinking of buying a little pre-made barn-type building – made to look either barny or house-like – and this was an interesting post for me. my problem being that with the space, knowing me, there will be something to rescue and i’m not so sure i’d want that. What a great post! I made my coop to look kinda rustic using pallet boards on the outside. I wanted it to look like a barn as much as possible without having to wait for the weathered look. I wish I could have done a concrete floor like you, mine is wood flooring, but at the time couldnt afford to put it down. Maybe next year! Pallet boards are a clever idea. I recently visited a neighbor that sells eggs pretty seriously to folks driving by (I consider it serious, as he’s got about 100 chickens, LOL!). I was purchasing straw bales from him and he let me see his animals. His chicken barns were just amazing. They used to be hog barns, and when he got out of raising pigs he converted them to happy chicken homes. 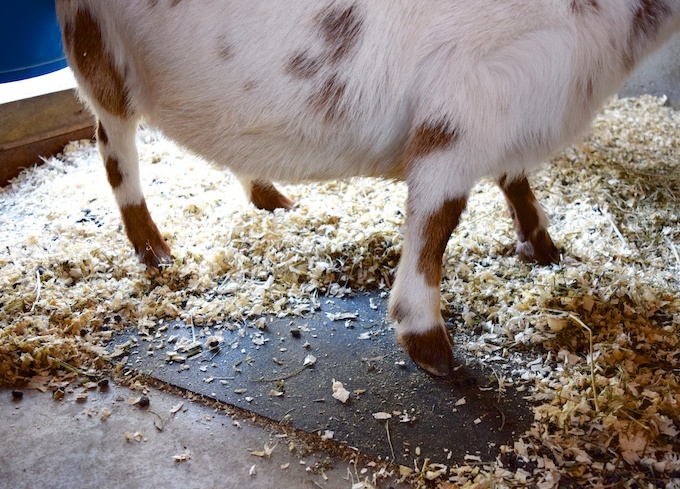 The floors were concrete but he also used a layer of bedding (pulverized corn cob I think). The rest of the barn was painted stark white and he had industrial sort of lighting up and it was just amazing. 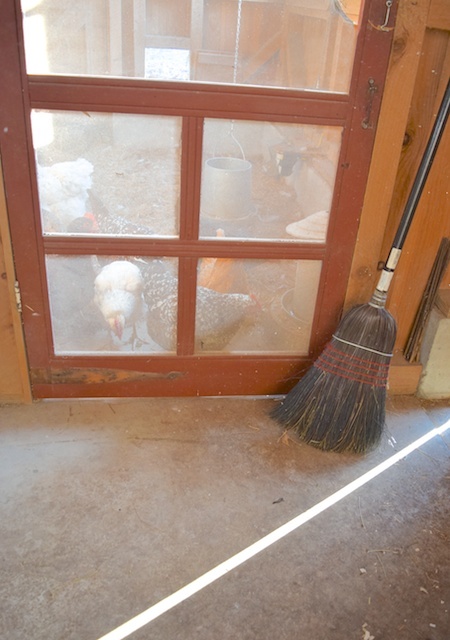 The chickens had doors to a fenced and covered run outside and they’d go in and out as they pleased. There was no smell other than clean chickens. Everyone was in perfect condition, and they were happy, friendly birds. And he didn’t know I was going to come by and take a look! Just an amazing chicken poppa for sure. If I didn’t have chickens of my own laying eggs, I’d buy eggs from him no doubt. Here at home we have an old converted garage that we use as a chicken coop and three sided covered run (well now it’s 4 sided as we covered the open side of the run with tarps, since it’s cold and all). The floor is dirt, and we use the deep litter method. It took a while to get used to and it’s a lot more work than what I thought it would be- but with our coop the way it is it actually works great for us. My husband even welded a special custom forked spade for turning that I can use that doesn’t kill my back! I don’t know if it’s a system for everyone though, as you mention in your blog here. 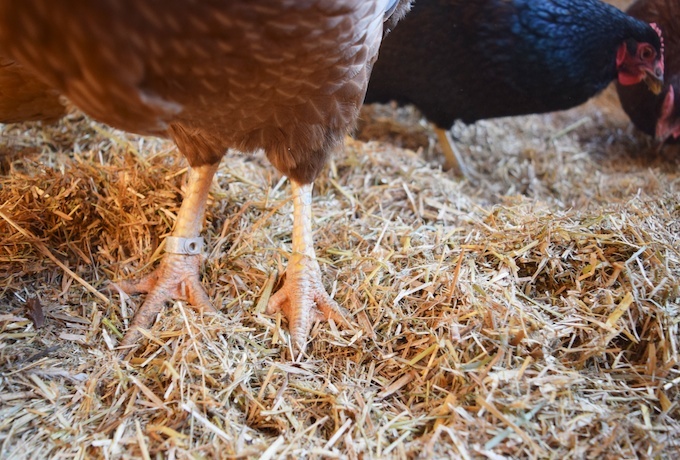 But especially in the winters, the coop is a clean place that my birds can still scratch and peck and find things to eat aside from their food that I give them. I haven’t had problems with disease. I’m a proponent of concrete as well. When we built my first coop I got a bit of ribbing from the ole-timer locals for my fancy coop but with all the predators around it was well worth the investment just for that reason. Easy to clean is a given too. I know so many people that routinely lose hens to varmints. I guess I wouldn’t keep them if I couldn’t keep them safe. I’ve only lost one hen in 12 years and that is when I forgot to lock up one night. Enjoy the blog Terry. Paging down, I have kitchen envy! Only one loss in 12 years is a very good record. I would love to have a barn like that with a cement floor! Sooo much easier to clean! Love the pics. Love your blog and am always eager to see the next post! !